For the many years that Paul and I have been living here in the Lion City, friends and family would sometimes ask us if we feel that "Singapore is boring." Every single time, we would tell them that we have never felt that way about this beautiful Little Red Dot and in fact, we always end up having an action-packed weekend filled with all sorts of activities. I always believe that one's perception of one's home is fully dependent on the person. Sure, we have friends who would rather travel to another country every other weekend while others would fall into a home-gym-grocery-mall-home routine week after week thus it's easy for them to say that there's nothing much to do here. I always believe that all it takes is a bit of creativity and an open mind and heart to what could be endless possibilities. Take one of our Sundays for example. It was supposed to be a lazy, event-less Sunday but Paul and I decided to explore our new neighborhood most particularly West Coast Park. We've been to the East Coast Park and saw a lot of people jogging, cycling, having a picnic and even camping. We wondered if this is also the case here in the west. The only way to find out is to head over there and to see for ourselves. The walk was pretty easy and luckily, the weather cooperated with us that day. 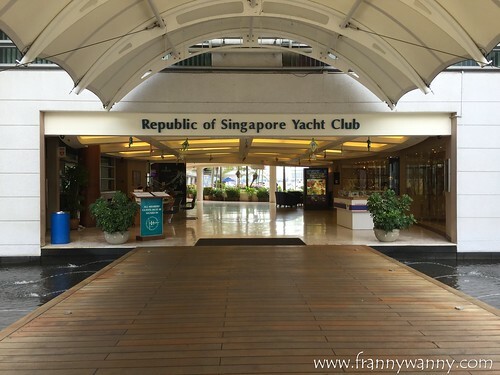 We walked for about 3 km until we reached the Republic of Singapore Yacht Club where we will be having our lunch that day. Say hello to the beautiful view! Didn't that photo above made your heart skip a beat? Every angle was just so picture pretty that I must have taken more than a dozen shots that day. Aside from the view, we were there for the food. One thing we found out was while the Republic of Singapore Yacht Club (RSYC) is an exclusive member-only facility, the public can actually walk in and head to Bridge Bistro and Beacon Bar which is located at the 2nd level of the Yacht Club giving you this amazing view. Just tell the guard and the reception officers that you're heading to the restaurant and they'll let you in without any questions. The walk made us hungry so we ended up ordering a storm! We started with two appetizers ordered based on our server's recommendation: Japanese Hokkaido Scallop Salad (S$28) and my personal favorite, Calamari (S$12). Service was really fast and we quickly got our orders without having to wait too long. That' just perfect as the short walk sure made us hungry. I was really impressed with the Japanese Hokkaido Scallop Salad. To be honest, I didn't thought much about it but what came were HUGE pieces of plump, fresh scallops sitting on a bed of chopped fresh tuna and cucumber salsa and drizzled with their homemade truffle dressing and topped with a generous amount of huge ebiko. We loved it! Luckily, one order comes with 6 pieces of scallops so we didn't had to fight for the last piece. I got to admit that there's nothing extraordinary about the Calamari but sometimes, don't we just want something that we're familiar with? I love the crunchy squid rings which I happily dipped into the garlic aioli sauce. This is one tapas that you can definitely order and know for sure that it will never disappoint. Apparently, Bridge Bistro and Beacon Bar offers a special Brunch menu every Sundays and since we were there and it was available, we grabbed the opportunity to also try their brunch items. 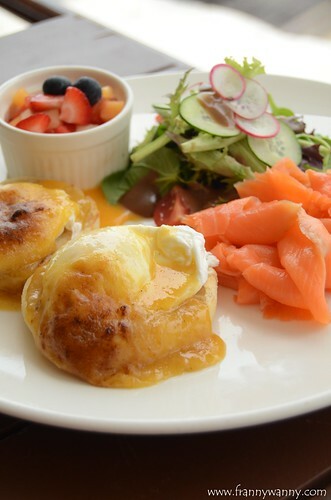 We tried Chef Marco's Salmon Eggs Benedict (S$15) which was delicious. First of all, I think the hollandaise sauce was well executed which I believe could really make or break an Eggs Ben. Secondly, the serving was very generous as it comes with two poached eggs each sitting on an English muffin and generously covered with hollandaise sauce with a good portion of salmon on the side. Not only that, it comes with some mesclun salad and fruit compote too making it a complete meal. Now, isn't that a steal? 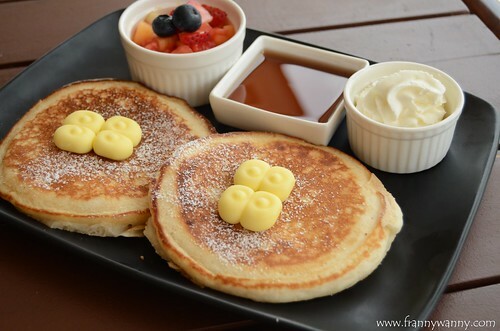 Now, what's brunch without pancakes? I'm such a big fan of pancakes and waffles that I couldn't pass up the chance to try The Bridge Banana Pancakes (S$14). Well, they added their name to the dish so this must be really good. I have to say that it was just a-okay. I found the pancake to be a bit too dry to my liking more so that I have the habit of not adding a lot of syrup to my pancake. I also feel that the banana flavor was a bit weak and it would be really nice to bite into more mushy bits of banana in every slice. At this point, I was starting to feel very full already but we still got two more dishes to go! This is what you get for working out before a meal. Everything..and I really mean, e-v-e-r-y-t-h-i-n-g on the menu will start calling out to you. 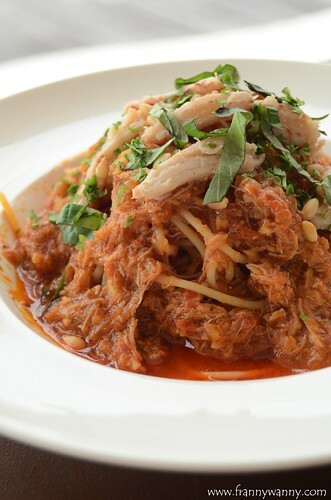 We tried the Crab Meat Spaghetti (S$24) which I have to say was really good. I was telling Paul and I don't think I can another bite but as soon as I tried this, I just kept on digging in for more. So much for self-control. I love the generous amount of chunky crab meat making each bite so delightful. It's interesting that the Chef added in some pine nuts giving it a more interesting dimension. 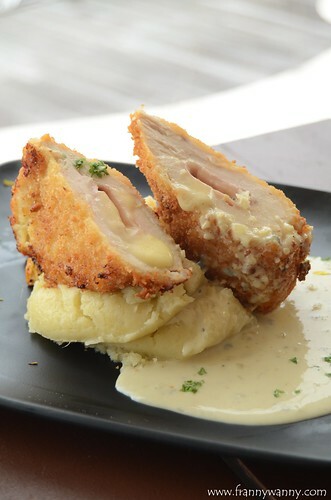 Lastly, we had the Chicken Cordon Blue (S$26). At first, we were really not considering this as we're not fans of chicken breast but since our server highly recommended this, we thought.."why not?!" This is one that kids will surely love. Perfectly deep-fried chicken fillet which is stuffed with turkey ham and cheese. I got to admit that the cordon blue was average but what will make me order this again is the yummy mashed potato which I love dipping into the blue cheese sauce. Of course, we gotta end our meal with dessert! 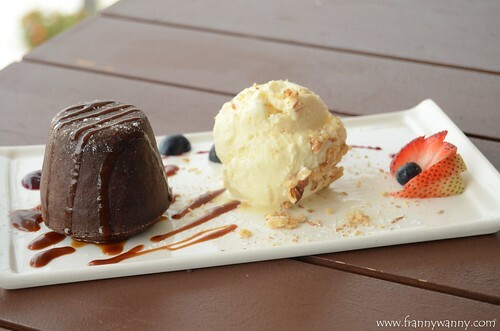 Since we're nearing food coma level, we shared the Chocolate Lava Cake (S$14.80). Who doesn't like chocolate and lava cakes right? Definitely a great way to end a hearty lunch. It's time to explore more of Singapore! 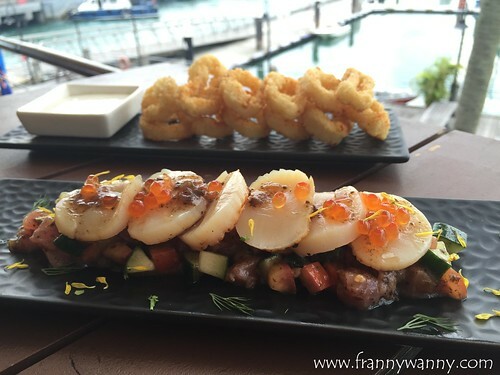 Head over to Bridge Bistro and Beacon Bar at the 2nd Level of the Republic of Singapore Yacht Club, 52 West Coast Ferry Road, Singapore 126887. Call them at 6768-9443.